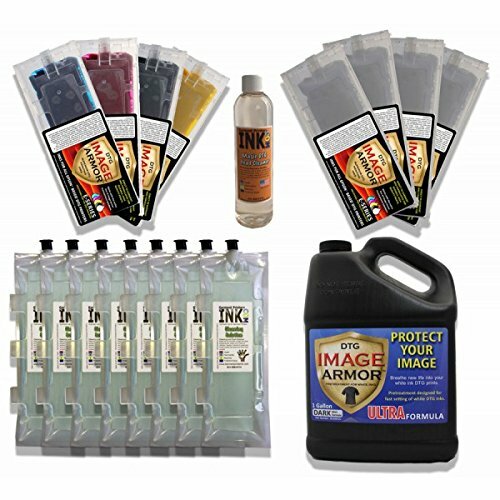 You get a Full 220ml Image Armor CMYK set and White set plus 8 Anajet Cleaning Bags, 1 Gallon of Image Armor Ultra Pretreatment and DTG Clog Cleaner for the Anajet Sprint, Anajet FP-125, MelcoJet and TexJet garment printers. The first garmentprinting ink in the industry to allow you to print on cotton AND full 100% dark polyester and everything in between. It has the fastest 35 second cure time, brightest colors and most elasticity of any garment printer DTG ink on the market.